110. The wives of Ravana wail for him. Even though stopped here and there by their maid servants , they started rolling on the dust of the streets , with disheveled hair and tormented by sorrow like the cows which have lost their calves. "O my lord, who destroyed you and your people and it is Sita the model of forbearance even to the Goddess Earth and a model of grace to Lakshmi. She is extremely fond of her husband. By a recourse to a fraud in bringing that Sita in a lonely forest, faultless in every limb as she was, and charming though miserable, and having failed to fulfill your desire for union with Sita and due to your own fault you have been surely consumed by the penance of that woman, devoted as she was to her husband." And she shined like a flash of lightning across the rainy cloud , reddened by the flow of dusk. All the women of his harem speedily followed him weeping stumbling and jumping from all sides. As per the rules laid down in the Sastras by the great sages, a goat was sacrificed at that spot and the Rakshasas, spread the limbs of dead goat dampened with ghee on the king of the Rakshasas. Vibheeshana then consoled his people and those Rakshasas who were residing in that city came near Rama and offered Vibheeshana , curds , unbroken rice , ball shaped sweets, puffed rice and flowers. After making Sita take head bath and dressing her up by young ladies , making her wear great ornaments , making her wear costly dresses , he made her climb a shining palanquin and after covering her with costly cloths Vibheeshana brought her before Rama accompanied by several Rakshasis. Due to modesty drawing her limbs inside Maithili approached her husband followed by Vibheeshana. 116.Sita enters in to the fire. They saw the wide eyed lady Sita who was shining like a golden altar plunge in to that blazing fire. 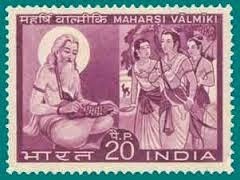 117.The Gods tell Rama that he is Lord Vishnu. “Among the Vasus you are the Vasu Rithadhama (standing for truth and divine law) who was the ruler of people , who was the chief of all the three worlds and you , yourself are the lord of all creatures. Thus ends the hundred and seventeenth chapter of the book of war of Valmiki Ramayana which is the first book. 118.The fire God returns Sita and says that she ins unblemished. Thus ends the hundred and eighteenth chapter of the book of war of Valmiki Ramayana which is the first book. Thus ends the hundred and nineteenth chapter of the book of war of Valmiki Ramayana which is the first book. 120.Rama asks Indra a boon to make all dead monkeys alive. Hearing these words of the great soul Raghava , Mahendra , again spoke the following words to him. Thus ends the hundred and twentieth chapter of the book of war of Valmiki Ramayana which is the first book. 121.Vibheeshana offers the Pushpaka Vimana for their return journey. Thus ends the hundred and twenty first chapter of the book of war of Valmiki Ramayana which is the first book. 122. The monkeys , Sugreeva and Vibheeshana travel with Rama. Thus ends the hundred and twenty second chapter of the book of war of Valmiki Ramayana which is the first book. Thus ends the hundred and twenty third chapter of the book of war of Valmiki Ramayana which is the first book. Thus ends the hundred and twenty fourth chapter of the book of war of Valmiki Ramayana which is the first book. At a distance of a krosa( two miles) from Ayodhya Hanuman saw Bharata, living in a hermitage, with the bark trees and the skin of a black antelope wrapped round his waist, looking miserable and emaciated, wearing matted locks on his head, his limbs coated with dirt, afflicted through separation from Rama his elder brother, subsisting on roots and fruits, with his senses subdued, engaged in austerities, protecting virtue, with a very high head of matted hair, covering his body with the bark of trees and a deer skin, disciplined, whose thoughts were fixed on the Supreme Spirit, with a splendour equaling that of a Brahmarishi, ruling the earth after placing the wooden sandals before him, protecting the people belonging to all the four caste groups from all dangers and attended by the upright ministers, priests and by clever troop-commanders, all clad in saffron robes. Thus ends the hundred and twenty fifth chapter of the book of war of Valmiki Ramayana which is the first book. "The great Rama, the destroyer of enemies, met Indra , Yama , Varuna , Maheshvara, Brahma as also Dasaratha (his deceased father) and was granted boons by them. Sages and Devas who came there, too gave boons." Thus ends the hundred and twenty sixth chapter of the book of war of Valmiki Ramayana which is the first book. "A great roar of joyful monkeys is being heard, for, they are seeing on their way trees which continually, yield fruit, adorned with blossom, flowing with honey which is drunk by bees which make reverberant humming sounds which is due to the grace of Sage Bharadwaja. Oh Bharata, the destroyer of adversaries, A boon also was conferred by Indra by virtue of which, a hospitality rich with all excellences was earlier extended by Bharadwaja to you, with your entire army. I presume that the aforesaid army of monkeys is crossing the rivers, Gomati." Then the valorous Raghava affectionately pressed the feet of his priest as well as well-wisher Vasishta , like Indra would press the feet of Bruhaspathi and made him sit in a separate seat near his own. Thus ends the hundred and twenty seventh chapter of the book of war of Valmiki Ramayana which is the first book.